Elevated white blood cells can indicate a number of different conditions. Your vet did a blood count test on your cat, and now he's saying she has elevated eosinophils. Yikes! Sounds bad, even after the doctor explains what eosinophils are. Keep your cool and don't panic just yet. The condition doesn't necessarily indicate a horribly traumatic disease. An increase or decrease in different white blood cells will alert your doctor that something is up with your cat's health. There are different types of white blood cells that counter different issues in the body, and eosinophils are among the specific white blood cells that have the responsibility of dealing with autoimmune issues, infections, allergies, asthma and parasites. 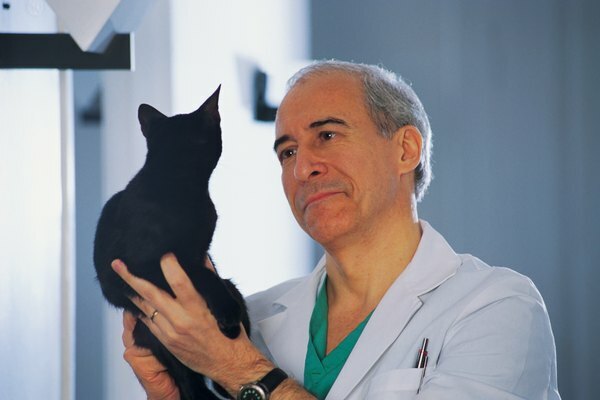 If your vet tested your cat to get to the bottom of symptoms like sneezing, coughing, itching, difficulty breathing, an unexpected skin condition, discharge from the eyes or nose, or a combination of any of them, elevated eosinphils will help confirm the diagnosis. Finding an overabundance of these specific white blood cells doesn't always require a blood test. A tracheal wash is one test that reveals plentiful presence of esoinophils in your cat's lower respiratory tract if she has asthma. Often your first thought when you hear "high white blood cell count" is leukemia. But cases of the disease associated specifically with high levels of eosinophils are rare. If your vet is concerned that a high white blood cell count of any type indicates cancer is a possibility, he will perform specific tests to rule out or confirm a cancer. On a positive note, elevated eosinophils in your cat's blood usually indicate one of the less serious causes, like an allergy or possibly asthma. The noticeable symptoms of each are much the same, but asthma is an issue with the airways -- so with asthma it's unlikely that you'll see symptoms like itching, runny nose and watery eyes. There are no cures for either condition, but there are ways to manage both. You don't have to start plotting ways to get your kitty to use an inhaler; instead, you can administer feline bronchodilators, steroids and anti-inflammatory drugs in pill form or as shots. Allergy medications like antihistamines and corticosteroids are just as easily given, and allergy shots are an option, too. Are Leukemia Shots Dangerous for Cats?